(A) 3D dimensional FLAIR in the axial plane at the time just before fingolimod initiation (July 2016) and after the patient became symptomatic (February 2017). Multifocal new lesions bilateral in the posterior fossa, thalamus, caudate nucleus, and frontal cortical gray matter occurred (arrows). In particular, the lesions in the left cerebellar hemisphere showed mass effect and vasogenic edema. Homogeneous contrast-enhancement patterns on the contrast-enhanced T1-weighed images (T1 Gd) and the intermediate low apparent diffusion coefficient (ADC) values of the diffusion weighted (DWI) images suggesting a higher cellularity raised the suspicion of a multifocal lymphoid proliferation. 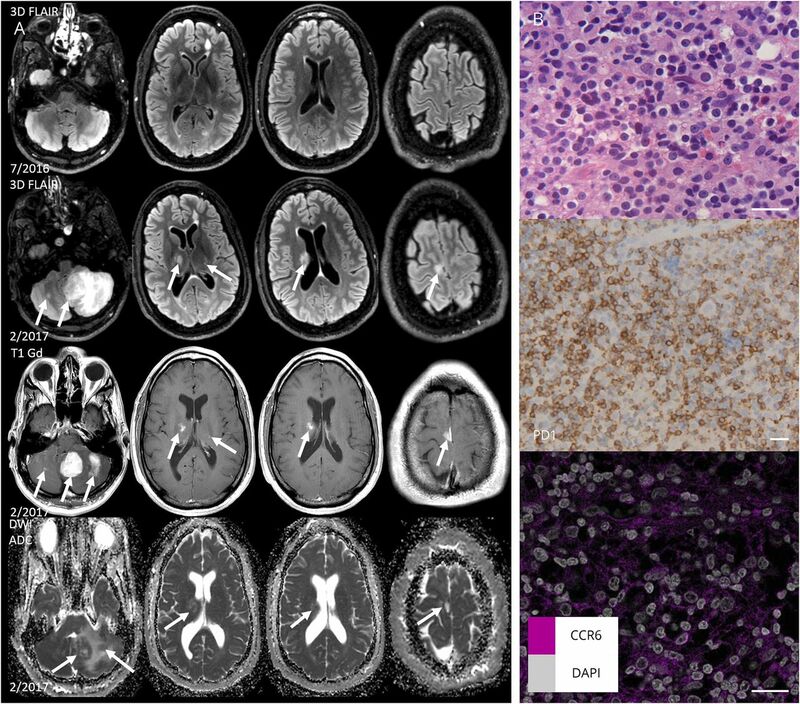 (B) Brain biopsy showing features of a moderately dense small cell lymphoid infiltrate without cellular atypia and without necrosis. Immunohistochemical staining underpinned a T-cell phenotype (CD3, CD4, CD5, and CD2) with a remarkable large proportion of PD1 positive T cells. There were only few small B cells (CD20, CD79a, and PAX5) and large, transformed cells were lacking. CD3- and CD20-positive cells are shown in figure e-1 (links.lww.com/NXI/A58). Sporadic EBER-positive small cells were present. Molecular T-cell receptor gene rearrangement analysis showed a pattern consistent with several synchronous dominant clones that differed between the 2 biopsies. This pattern further supported an oligoclonal process. Immunoglobulin gene rearrangement also showed a pattern consistent with an oligoclonal B-cell proliferation. The T-cell phenotype and genotype were most consistent with a reflection of a dominant T-cell dysregulation, possibly with premalignant features and likely in association with a dysregulated B-cell proliferation, which was also of the nontransformed type and EBV negative. Immunohistochemical staining for CCR6 in the lymphoid infiltrate brain tissue was performed according to standard methods (see data supplement, links.lww.com/NXI/A59). After washing, nuclear counterstaining was performed using DAPI. ADC = apparent diffusion coefficient; DAPI = 4′,6-diamidino-2-phenylindole; DWI = diffusion weighted images; EBER = in situ hybridization for Epstein-Barr virus; FLAIR = fluid-attenuated inversion recovery; T1 Gd = contrast-enhanced T1-weighted. Scale bars 50 μm.